You can listen to the latest episode of my Podcast series HERE!!! I am sorry that Episode 4 is, er, a week late! I actually explain in the episode why I didn't update last week, but in short; I went back to University, and I was also ill. So, yeah, that's what happened! That said, I also didn't have much to talk about last week, so... yeah! Still, I wish I hadn't missed on last weeks episode! Good thing I said this series may just be bi-weekly, right!? Anyway, aside from talking about being a bit ill, I also talk about a film I recently went to see, and also gave my scattered thoughts on it (without spoiling the plot, thank goodness!) as well as talk about film in general and what I look for in film that appeals to me as a viewer, as well as some talk on the newest H!P Unit reveal! Because, seriously, how can one NOT talk about that? T'is big news, baby! 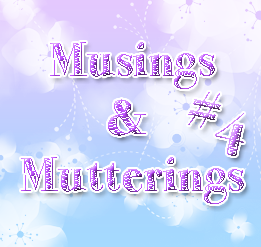 I have fun making the gradients for my little thumbs for Musings & Mutterings! SO PRETTEH! Hopefully for this week, you will all enjoy what I say! If you have any ideas for topics, lemme know, I am open to topics to chitter chatter about! It can be Idols, Life, Experiences, Advice... anything! OH GOSH, LET'S MAKE A CORNER! Like 'Chiima's Chitter Corner' or some bull like that, where I say something like advice or stuff like what I was like in school, or my experiences in work/school or whatever... STUFF. LIKE. THAT! Whaddaya say!? Or you could have a 'Chiima, try an accent' thing, or 'Chiima explains slang' or whatever XD LET'S HAVE FUN and LET'S GET A CORNER! Cause you guys may be intrigued by it, YES!? LET'S GO!!!! I'M PUMPED FOR THIS PODCAST SERIES, AND I LOVE YA! I really like watching fantasy films, and I'm looking forward to "Pan" as well! Saw it as the trailer when I was watching "The Hobbit 3", lol. It looks like a new take on the story that reminds me of Tim Burton's Alice in Wonderland adaptation some years ago. Similar concepts. I like the thumbnails you make for your podcasts too, they're so pretteh~~ XD Hahah! It is a good film, so definitely take a look at it when you can! And Taylor Swift has a song titled Out of the Woods? Ooooh! XD Did not know this! I really think Pan will be exciting as a new take on the story, so I look forward to it! I like how, with these sorts of fairytales and stories, we keep reinventing them for the big screen, so I want to see it!